Light: Nurturing yourself and others. Bearing fruit. Celebrating your body. Bearing (literal or figurative) children. Reveling in luxury. Mothering those around you in positive ways. Enjoying your sexuality. Getting things done. Shadow: Overindulging. Being greedy. Smothering someone with attention. Debilitating someone by being overprotective. Inhibiting productivity by obsessing on productivity. Being overcome by addictive behavior. Mythical/Spiritual: Gaia, Mother Earth, Ishtar, Demeter—mature, reproductive female divinity in every form. Also Aphrodite and Turan. Story: A motherly or nurturing figure reminds the main character of the core values that are the essence of his or her character. Relationships. Without going overboard, revel in your sensuality. Take care you don’t produce more than you intended; the moment is pregnant with possibility. Be lavish with demonstrations of affection. Watch for what a friend or partner needs, and then supply it in abundance. Work. Now is the time to get things done. Wrap up projects. Ask for resources. Meet deadlines. Move ahead. During this time of growth and expansion, be sure you have the skills and training you need. In the meantime, don’t mistake a headlong rush for focused, verifiable progress. Spirituality. Women are the figurative and literal door to this world. This moment, too, can be a door for you—a threshold you cross into a new awareness. Watch for physical ways to express your spiritual insights. Reconnect with nurturing, feminine images of divinity, including nature. Personal Growth. Your attitudes toward women (and your insights into your own feminine qualities) are likely rooted in early experiences. How can you emulate the best female role models you’ve encountered? How can you transcend female influences that harm or hold you back? Fortune Telling. Pregnancy is in the cards. An opportunity to be involved in luxurious sexuality is coming. Beware a tendency toward addiction. When? Within seven and one-half months. Venus. The familiar planetary symbol for Venus often appears in illustrations for Trump 3, stressing the Empress’s association with domesticity, motherhood, and female sexuality. What course of action might these themes suggest? The scepter and crown. The Empress’s scepter (a symbol of authority) is topped by a cross and an orb, a sign of earthly dominion. In RWS-influenced images, the Empress wears a diadem of 12 stars, suggesting her dominion over the circle of the year. What do you have dominion over? The cushioned throne. Unlike the rigid stone throne of the Emperor, the Empress is often depicted on a cushioned throne, emphasizing themes of luxury. How might themes of comfort or indulgence impact your situation? Pregnancy/Ripeness. 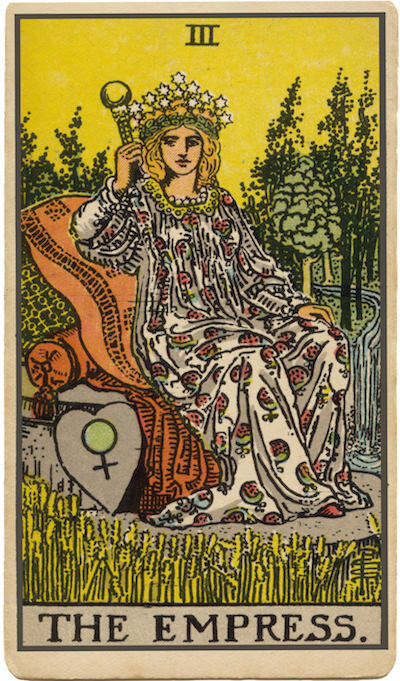 A universal sign for fertility is pregnancy; in many decks, the Empress is pregnant, emphasizing themes of fertility and productivity. In your situation, what outcome struggles to be born? The rushing stream. Unlike the vast, still, reflective body of water often shown behind the Priestess, the Empress is often seen near a rushing stream or waterfall. Is it time to put your intuition into motion? What would a concerned and capable mother do? What can I do that would emphasize growth? How can I celebrate my own sensuality and sexuality? I'm the author of A Guide to Tarot Card Reading, A Guide to Tarot Card Meanings, and eight other Tarot books. I'm also the creator of several Tarot decks, including the Lo Scarabeo Tarot, The Tarot of the Elves, and the Bright Idea Deck. Text on TarotTools.com, unless noted otherwise, is free to use elsewhere under a Creative Commons "share and share alike" license, as long as the following credit line is included: "Content from Mark McElroy via TarotTools.com."